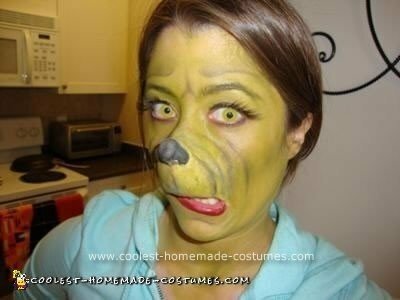 This Homemade Grinch Halloween Costume Idea was the perfect costume for me! 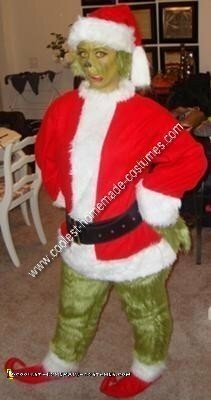 Not only do I love the Grinch Who Stole Christmas, but I love homemade Halloween costumes so I was up for the challenge of making this one as realistic as possible. I found some great faux fur fabric on amazon which was the PERFECT olive green. 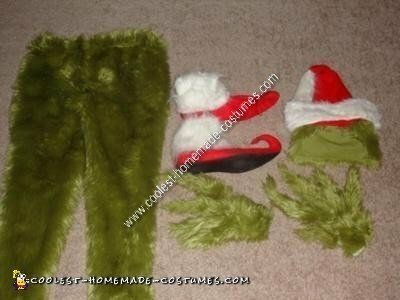 I used the fabric to sew pants as form fitting as possible to look like Grinch legs. I also used the fabric to make his signature hands with the long fingers and as hair peaking out of the bottom of the Santa hat. I found some white fur at the fabric store, used to make the top of his elf shoes and some bells for the point of the toe. I made a Santa jacket to fit my little frame, stuffed a pillow in my pants for his larger belly, and that completed the outfit! Most importantly though was the face! I purchased yellow contacts, long eyelashes and a prosthetic Who Nose from FX Warehouse. My friend is an artist and she was able to apply the nose to my face and paint it to look JUST like the Grinch! I have never had more fun on Halloween! Hope you like it. this costume is INCREDIBLE! you deserve to win for sure! this costume is bootyful to say the least!!! What type of facemakeup did you use? hi i live in Kansas and my school is doing a Broadway musical, and its my job to get the Grinch costume, and i want to get the best and cheapest one possible, so i really need help,and this looks soo amazing im 14 and i was just wondering if you could help me in any way. I would just order a Santa costume for the top. Purchase it over sized so you can stuff the belly with a pillow. For the bottom I made the pants out of faux green fur I purchased online. I also sewed the hands and the hair from this fabric. I purchased this prosthetic nose to make me look like a Who. I had a friend paint my face so I can’t really say what types of paint she used. Hope that helps! Let me know if you have any more questions! Shannon how many yards did it take in order to make the costume. I am directing How The Grinch Stole Christmas for my church. Don’t know if you still read these, but I just purchased the olive green fur from Amazon and the picture it showed looked a lot more green. The product I just got looks more yellowish with a tint of green. Did you order thru the fabric empire on Amazon? Did you order through the Fabric Empire on Amazon? I just purchased the olive green fur through them and it does not look like the picture it showed. It looks almost yellow. Not sure if you still read these but if you do, I would appreciate your help! I can’t remember if I got it off of Amazon or Etsy. I remember I was deciding between the two. Try Etsy. I searched “green faux fur” and a lot comes up at decent prices. Did you use a sewing machine or did you sew that by hand? I am trying to figure out how to make this costume and don’t know where to start. LOL! Did you use a pattern to make the hands? If so, did you make it yourself or use one you got somewhere else? If you got it somewhere else, where? Thank you.